I always have mixed feelings this time of year. Our last post usually means changes with our TIP group of gals. We have all grown in our art, our photography and even our businesses. It's a good thing.. but it often means our schedules change and we all can't keep up with the demands. I'm going to miss those gals who won't be participating next year! This last post of the season is Cast Iron Cookware/ or Favorite pots and pans. My favorites are definitely my cast iron. So.. everything cooked here today has been baked, browned and grilled on three different forms of cast iron. 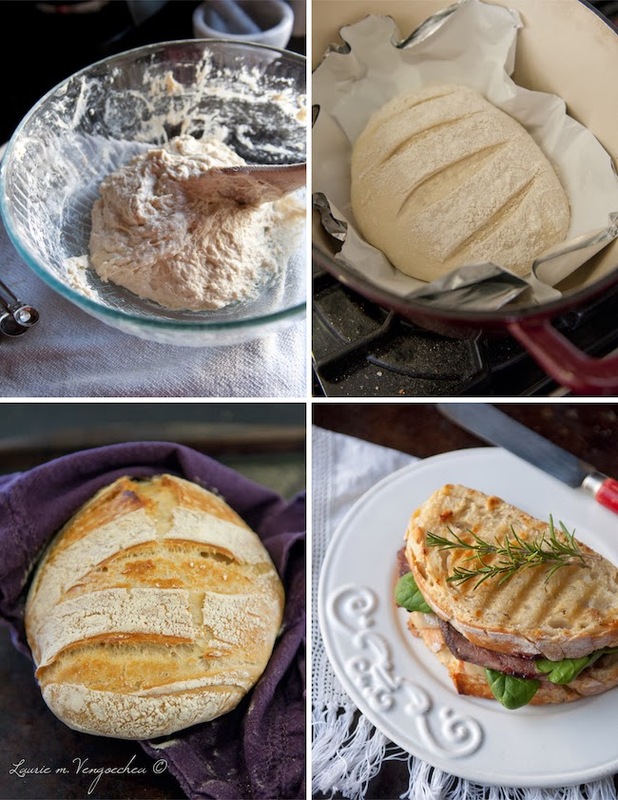 My Artisan Boule bread was baked in an enamel coated cast iron dutch oven, my leg of lamb was warmed/browned in my favorite antique cast iron pan, and my panini sandwhich was pressed and grilled on my cast iron grill and weighted down with a cast iron pan. I hope you enjoy the photo journaling of this recipe.. I enjoyed preparing it just as much as my little family enjoyed eating it! I used the no knead procedure here. 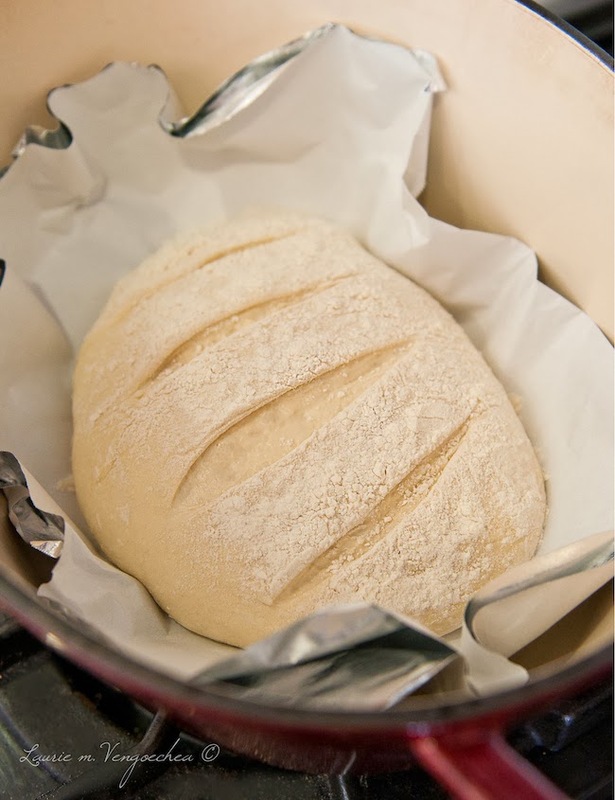 It made a WONDERFUL dough with beautiful air pockets, crunchy crust and a perfectly chewy crumb! 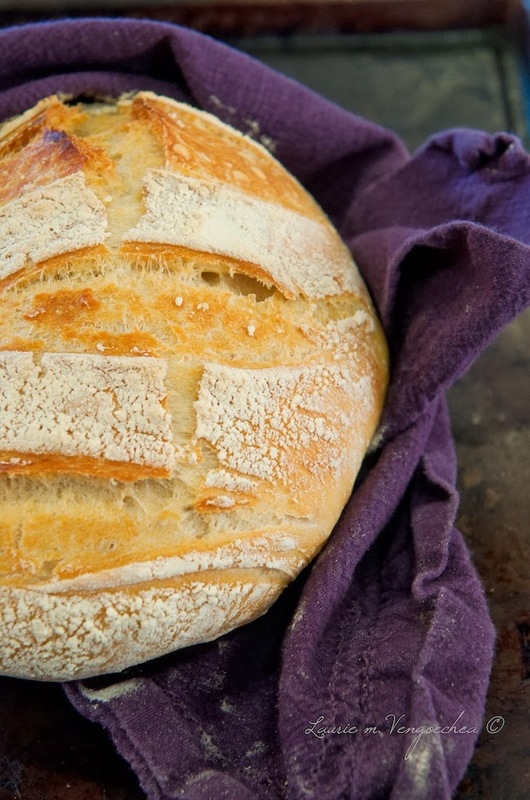 The best recipe I have yet used for bread! Baked in an enameled cast iron pot. So easy and quick!! This pretty little piece of pottery is from my daughter Kat, who bought it for me at her college's Art Department Christmas Boutique. She bought it specifically for my photo stylings. :) I love the colors and have decided these shades really do need to appear more in my photo shoots! I made a rosemary & herb crusted roasted lamb for Christmas dinner. It was SO moist and made the perfect grilled panini sandwiches! Spread a hearty helping of currant jam on the inside slices of bread, thick slices of English cheddar cheese, good sized portions of lamb slices. Spread butter on outsides of bread. Place on hot cast iron grill and place a heavy cast iron pan or pot on top to weight it down. Turn over to grill on other side. When done add spinach.. Voila! 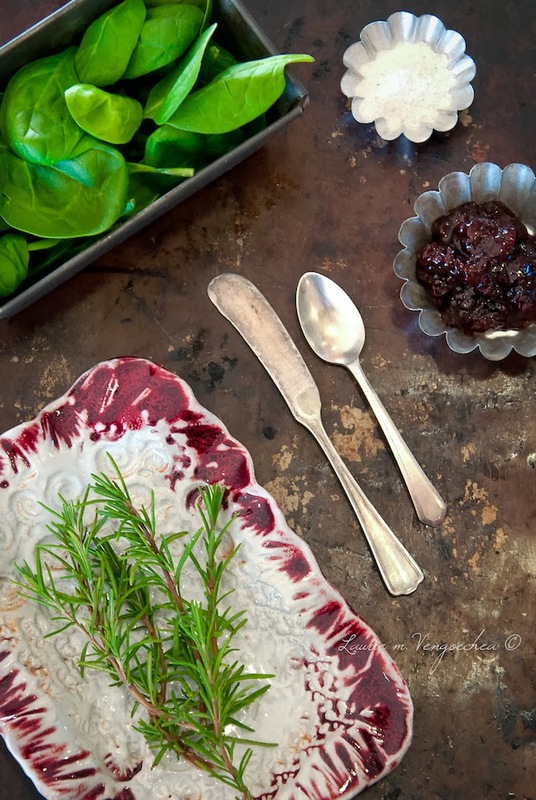 Be sure to head on over to see what my dear friend Stacey Siegal | Kitchen Serendipity | Longobat Key & Bradenton FL Photographer is cooking and photographing! Love the dish your daughter picked out, she is right, it is perfect for food photography! 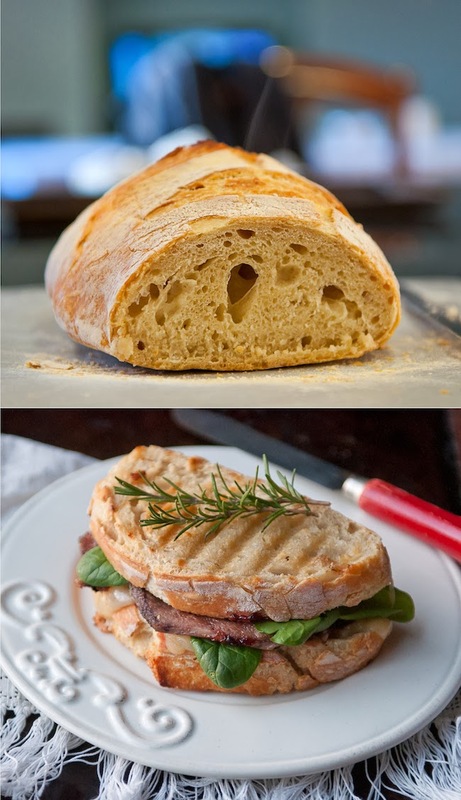 Your meal looks delicious especially that homemade bread---yum! 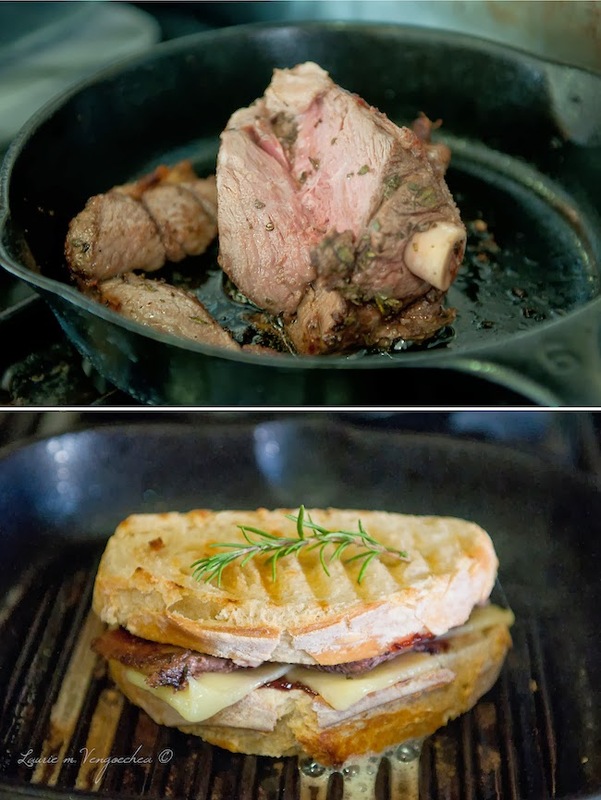 Wow I can't believe you used 3 different types of cast iron for this challenge - you really went above and beyond :) That bread certainly does look delicious, that panini is beautifully presented, it looks so fresh! I just found your blog from another Italian food blogger that I've followed for years. 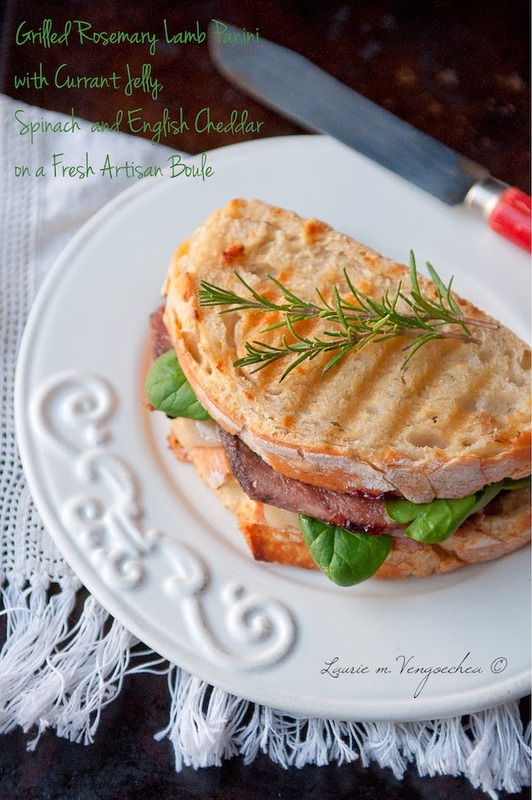 I just love your blog; this panini recipe is delightful and your photography is magnificent. Do you have an email subscription link? I 'liked' you through FB though. Nice to find another Italian food blogger! Wow, I just went out to eat, and I'm already getting hungry looking at your pictures! Love this panino and your photography is extraordinary, Laurie! Pinning this! Thanks for your visit to my blog last week. Glad to be following you now.